Rice flour dusted, dipped in egg-wash and rolled in Coconut flakes, than panfried and oven baked until crispy and succulent and flaky. 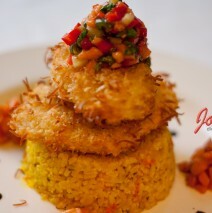 Topped with Papaya Salsa on Rice Pilaf and served with Caramelized Musquee de Provence Pumpkin. This is a Gluten free meal.